Unlike neighboring Banff and Jasper, no reservations are taken for camping in Yoho’s vehicle-accessible campgrounds. All sites have a picnic table and fire ring, with a fire permit costing $8 (includes firewood). When all campgrounds are filled, campers will be directed to overflow areas. 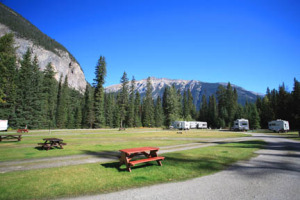 The park’s main camping area is Kicking Horse Campground (mid-May to early Oct., $28 per site), five kilometers (three miles) northeast of Field along the road to Takakkaw Falls. Facilities include coin showers ($1), flush toilets, and kitchen shelters. It offers a mix of forested sites and a few suited to larger rigs in a grassy loop. Back toward the TransCanada Highway, Monarch Campground (mid-June to early Sept., $17.60 per site) offers more-limited facilities and less-private walk-in tent sites. Hoodoo Creek Campground (mid-June to Aug., $22 per site), along the TransCanada Highway, 23 kilometers (14 miles) southwest of Field, provides 30 sites among the trees and facilities that include flush toilets, hot water, kitchen shelters, and an interpretive program. At the end of the road up the Yoho Valley, Takakkaw Falls Campground (July to Sept., $18) is designed for tent campers only. Park at the end of the road and load up the carts with your gear for a pleasant 400-meter (0.2-mile) walk along the valley floor. No showers are provided, and the only facilities are pit toilets and picnic tables. Just below Lake O’Hara is a delightful little campground surrounded by some of the region’s finest hiking. It can only be reached by scheduled shuttle bus or on foot. For more information, visit the Lake O’Hara camping page.